“Brother please take care of my wife and kids” was the last line in a text I received from S. He had learned earlier that he would have to go back to immigration detention, leaving behind his wife and children. For whatever reason, the Commandante decided that for all asylum seekers on bail in Bangkok, this was to be their fate. For asylum seekers in the Bangkok, a long drawn out process of on average 5 to 8 years exists for them to progress through the steps to refugee resettlement through the UN. Resettlement is not guaranteed even when one becomes a refugee. People seeking asylum are given an identification card by the UNHCR, and then must wait for their UNHCR interview. Because of the backlog, this generally takes several years. Once their interview is done, they must wait on the UN’s decision on whether they have been granted refugee status. It is not easy to get refugee status. The UN’s caseload is already so great that they tend to err on the side of denying it. If someone is denied, they can appeal. The appeal process generally takes another couple of years. If they are refused then the UNHCR closes their case and they lose whatever protection the UN can offer them. Those that are fortunate enough to be granted refugee status become eligible for refugee resettlement in a third country, though resettlement is not guaranteed. It can take years for the UN to find a country that will take the refugee in, and then it can take years for the country to complete its process of background checks, interviews, medical exams, etc. before the refugee finally makes it to the third country. All this does not happen in a vacuum. While it happens, asylum seekers must face Thai immigration. Thailand doesn’t recognize the rights of asylum seekers, and since most asylum seekers are unable, for monetary reasons, to keep up their visas, they overstay them and are considered illegal immigrants. When that happens they are subject to arrest and indefinite detention in IDC – the Immigration Detention Center. Back to the story of my friend S. Back in 2015 he was arrested by Thai immigration and sent to IDC where he spent two months before an NGO paid his bail. Since then he has had to report to IDC twice monthly to keep up the conditions of his bail. Sadly, he learned today that, for whatever reason, officials had decided to revoke the bails of any asylum seeker who had not yet attained refugee status. In the process described above, S has been in Bangkok for three years, but he and his family are still relatively at the beginning. He had his interview for refugee status just a few weeks ago and is now waiting for the UNHCR to make a decision as to whether he and his family will be granted refugee status. Because he is not yet designated a refugee, he falls under the immigration’s new rule revoking his bail and he will have to return to IDC. This is just absolutely heartbreaking. He has a wife and two young sons that he was caring for that will now lose their father to something that seems so senseless. And now it’s up to us to care for his family and others. N is another asylum seeker that must return to IDC. He leaves his wife who is recovering from breast cancer and just finished her last chemo treatment. He has two small children and an adolescent boy. Again, he leaves the care of his family to us. I hope we can step up and see them through this crisis. Surely God has answered our prayers and spared us another anguish, at least for now. Apparently the UNHCR was able to convince the Thai immigration officials that implementing their new policy would not be the best course for now and they have decided not to require bailees to report back to IDC for detention. A couple had already returned to detention and they will be re-released in one month. Please continue praying though because they will be revisiting the matter in August. 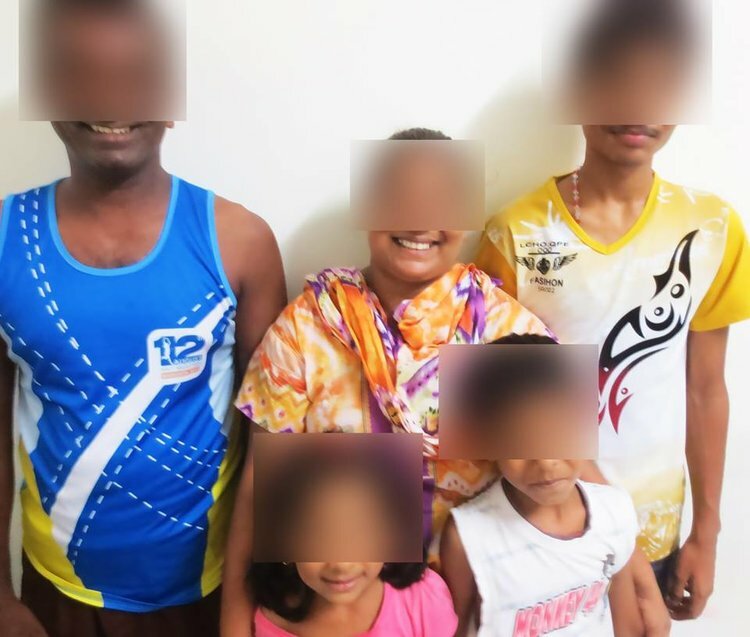 The family pictured above in the photo will be going back to Pakistan because their case was closed by the UNHCR, and the wife and mother is undergoing cancer treatments and in spite of that immigration is not allowing her a medical exception to stay out. Going back into detention is obviously not in the best interest of her health and so the family has no viable choice but to return to Pakistan and try to upkeep her treatments. We don’t know if it’s possible but if they could return to Thailand on a medical visa that would be ideal.